Add to cart to see best price online! NEW for 2017! 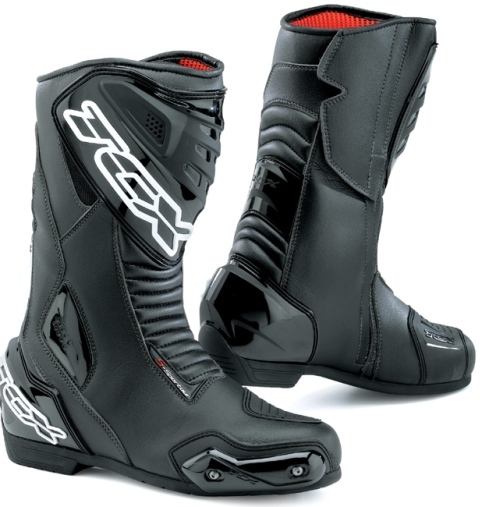 TCX R-S2 EVO High performance racing boots. Upper is micro fiber, breathable and high wear resistant, microinjected inserts, padded front and rear area,for better comfort and flexibility. Lining is Air Tech breathable double compound PU soft padding around the ankle. Reinforcement of polyurethane shin plate with iron mesh air intakes, polyurethane shift pad, internal suede heat guard, replaceable high resistant allow toe slider and ankle slider, polyurethane fixed calf slider. zip and Velcro closure with an elastic insert to allow a better fastening. Anatomic footbed, extra light and breathable. Reinforced mid sole. Low profile rubber sole with specific grip areas. Avail in White/Black or Black/Graphite in Sizes 8-14. Please select free freight when ordering in mainland USA. Please click on pic for closeup view. Add to cart to see best price online ever! TCX 2017 S-Sportour Boots have a micro fibre upper with front and rear padded area. Breathable Air Tech Lining. Reinforced in heel guard, shin plane, shift pad and PU Ankle reinforcements. Interchangeable poly sliders. Replaceable footbed with a reinforced PP mid sole, Zip and Velcro closure. Avail in Black in sizes 5-14. Please select Free Freight when ordering in the mainland USA. 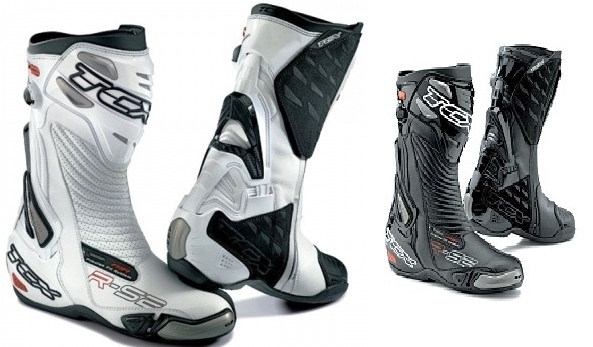 TCX 2015 R-S2 Race Boots. FREE FREIGHT! Regular retail price is $305.95 but Add to Cart to see our Best price! The 2017 TCX R-S2 Race Boot is avail in Black or All White. Sizes are 7 thru 14. This high performance Street boot has a vented micro fiber upper with an air tech breathable lining. You can PUMP This boot up for the perfect fit! Improved shin plate and shin pad. PU toe Slider, Zip and Velcro closure with a wider adjustment area. Padded front and rear ankle area, anti-bacterial footbed and an TCX Racing Sole with specific grip areas that are oil and petroleum resistant.Sliders are replaceable and are high resistant alloy toe sliders with hidden screw system, polyurethane calf slider. Please Select FREE FREIGHT when ordering in the mainland USA. DAINESE Techno Flor/yellow/black Leathers. This suit cost over $800 new and was only worn TWICE, crashed in and then repaired. A lesser suit would have surely hurt the rider but not a scratch! Road rash only! Most has been removed and suit for is whole and decent! Looks great! Has a removable vented liner, Size is 56 Euro US size 46. All Zippers work fine, Pads on knees hardly show any wear. This is an excellent chance for you to try a top of the line suit for only a fraction of the price! Please select Free Shipping in the mainland USA! SORRY SOLD 11/07/2016.